Currently the surefire plugin does not evaluate @DisplayName in the test reports. It would be great if Surefire would use @DisplayName where present. myFirstTest(TestInfo)  Time elapsed: 0.035 sec  <<< FAILURE! In contrast the output from the IntelliJ plugin using the @DisplayName results in more readable test names. 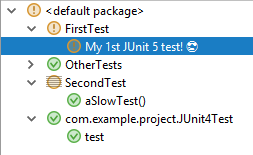 My 1st JUnit 5 test! 😎  Time elapsed: 0.035 sec  <<< FAILURE! The rationale behind not using display names is that it would "break" the XML report generated by Surefire. Thus, we need a new reporting format and Surefire needs to adopt it before we can report display names (cf. #373). +1 to what @marcphilipp said: it's unfortunately not possible to support all JUnit Platform reporting features in reporting systems that only support JUnit 4. So, the entire world has to wait until there is a new reporting standard which supports custom display names, test sources, etc. The rationale behind not using display names is that it would "break" the XML report generated by Surefire. So how come Gradle reports are fine? Because our Gradle plugin uses ConsoleLauncher to write these XML reports. Since JUnit 5's Surefire provider is currently being taken over by the Maven team, the JUnit Team is not actively working on Surefire related issues. I was wondering what was happening in Surefire wrt JUnit5. It appears there is a single committer on the project. They are obviously doing an heroic job there, but there is a limit to what one person can do. Therefore, tickets for fixing the reporting of new JUnit5 features are not being worked on. IMHO, having JUnit5 without first class support for new features in Surefire is pretty pointless given the importance of Maven to the Java ecosystem. Is this something that the JUnit5 team are concerned about? Is there a plan to address this issue? @k1w1m8, please see my response in #1320 (comment).